Tello Mobile has updated its referral program. Those who successfully refer someone to signup with the wireless provider will now get a $20 account credit. Previously $10 was awarded to the referrer. This is a limited time offer. Tello Mobile subscribers have until November 15th to earn the extra rewards. Tello has just announced a promotion to mark the upcoming start of the fall season. 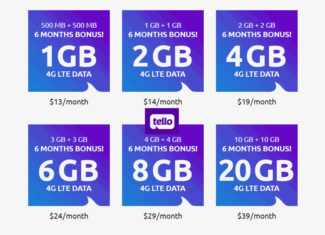 New subscribers can get one month of free service on Tello’s $14/month Starter plan. The plan features unlimited talk, text and data with the first 1GB at 4G LTE data speeds before throttling to 64Kbps.